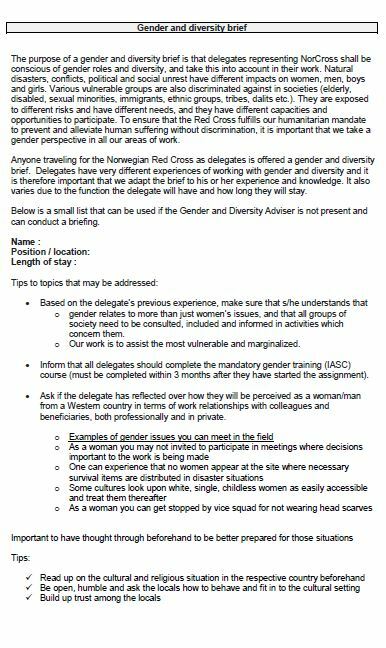 This brief aims to ensure that delegates representing Norwegian Red Cross (NorCross) are conscious of gender roles and diversity and take this into account in their work. Based on the delegate’s previous experience, make sure that s/he understands that: gender relates to more than just women’s issues, and that all groups of society need to be consulted, included and informed in activities which concern them; our work is to assist the most vulnerable and marginalised. Ask if the delegate has reflected over how they will be perceived as a woman/man from a Western country in terms of work relationships with colleagues and beneficiaries, both professionally and in private. Delegates can be encouraged to show, through attitudes and behaviour, that they support gender equality and non-discrimination towards colleagues and beneficiaries through ways in which they feel comfortable. Reference: Norwegian Red Cross. Gender and Diversity Brief. Pp.1-2.